The blue sky was his paradise. John Smith, local owner of ABC Business in Sometown USA, loved days like today. The clouds were few and far between; their count mirrored by the constant warming of the sun’s rays spilling onto his skin. In fact, if he didn’t know any better, John would assume he was now walking through heaven. “Good morning Mr. Smith,” Abe, the new sales associate smiled his greeting. “And a great morning to you, Abe!” John returned as he left the parking lot of his company. John saw the haunting the colors of the dancing flowers outside of his office. The rounded umbrella-like coneflowers now were presenting purple and pinks and yellows to the rhythm of the breeze. The lavenders were pointing straight to the sky, towering their hues for all to see. And even the yarrows, calm and white in contrast, were finding the songs the winds were playing with perfect harmony. John Smith, happy local owner of ABC Business in Sometown USA was on cloud nine. John stood in front of his favorite morning ritual’s alter – the coffee machine, and his first cup of the day. The bitter tones of the brew, mixed with his favorite creamer gave him the feeling of sneaking ice cream every morning for breakfast. John sat down, the sitting down that only the select few know. The few who control their worlds. The feeling of omnipotence floated by the tip of his nose as his smile relaxed to calm grin of sheer peace. Since then, John Smith, the panicked, nervous owner of ABC Business in Sometown USA, has been trying to reclaim the idea of the damage done to his business. The thoughts of the hacking that led to this dark day, in an otherwise peaceful world, are all-consuming now. His customer conversations are gone. Files and data he coordinated via email have been breached; some fully deleted never to return. This business owner will spend months reclaiming connections lost in this breech. He will spend thousands remarketing and re-branding to gain back the trust of previous and current customers. And, he will spend years and more money to fix all of his security loopholes that he never even knew existed. On average, CSO Online estimates that enterprises spend over $1,300,000 on hacked systems. In the same report, CSO states small and medium sized businesses spend roughly $117,000 per year on intrusions. The above was a simple example of any business owner in the United States (and beyond). Your life feels perfect on that fateful day. And then you get a call, or a text, or an email – and it all goes south. 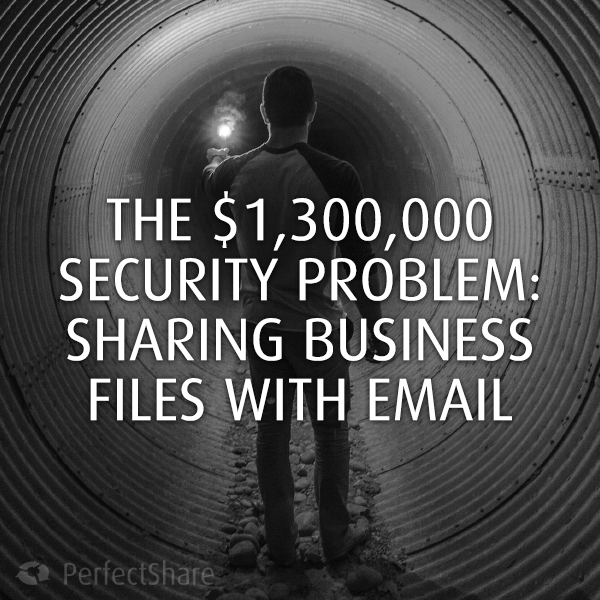 Sharing secure business data via email is a mistake, plain and simple. The damage it can do goes beyond losing some business. In fact, according to Egnyte, businesses can also see their share prices fall by large numbers (Sony by 10%, Yahoo! by 7%), and hefty fines being handed out due to hacking attempts. Hacking is a large issue for businesses, but it isn’t the only one that we should look at when we talk about email. The art of email project management is the other fallacy. We do not have a good method of using version control, nor of tracking conversations and data handling over email. Do you currently use email to control projects? Do you have separate conversations with project members, with the occasional CC happening? The process is very tedious. And, it can spaghetti out of control very fast. Imagine talking about the possibilities of one project in another, only to lose your progress with yet another project because of it. Files can be lost, go to the wrong people and can be deleted and over-written again and again and again. For sure, the above can and does happen, and is often the root cause of most managers’ headaches! Need a receipt of a customer viewing a file? The larger question when using email for project management and data sharing is how do you handle reporting? Reporting in email file sharing doesn’t work programmatically. It also creates a time sink for managers to sift through emails, copy and paste parts of conversations, noting files sent and received, and so on. A lot of time that could be used to make more and better products gets used in investigating your own projects. One other issue in email file sharing is being notified of who saw what and when. Yes, you can use receipts and other nifty gadgets in the older version of web-mail and email clients – but not today. Today, email is a bit more lean on the antiquated technology, and more aligned with speed and consumption needs. Share business data in email, and the receiving party can see the data. Keep the conversation alive and well, and the project nears closer to completion. But, how do you add people to the conversation? Forwarding? Start to include via CC? And what if you want to remove someone from that particular collaboration? If your company needs to be held up to a compliance requirement or guidelines, access control is a necessity not a simple feature. Being able to fully remove someone’s ability to see and further share data can qualify you or discount you from HiPAA, PCI DSS and FedRAMP compliance. While you can stop someone from participating in a conversation in email, you have no clear way of limiting their ability to alter files sent and/or received, read and viewed. This means that if the wrong the person, gets the wrong email, you could be looking at compromised files, malware or worse. Cybersecurity has become a daily bit of business in our world. 2018 will do nothing but this word and the cybersecurity world as normalized as an accountant or a manager for your company. When you use email as your primary method for transmitting and receiving data, you open yourself up to numerous attacks, from numerous points. You get your files prepared for transit. You enter the target emails for the data shares. You type in a title, and a description, and click send. Your email now bounces along until it lands in another user’s mailbox. The receiver opens up the email. They read your description, and download the files for viewing. The most basic issue with email collaboration is that most data is transmitted in plain text. This can be read from anyone snooping on that data as its transmitted. This can be helped by only sending data over SSL. Another way is to use an encrypted method – something like PGP. But what about securing passwords for those email accounts? What about the email server? What about the company’s server in general? And don’t even get me started on phishing attacks! The point is, with email collaboration, your amount of needed direction and assistance for cybersecurity issues rises incrementally over time. Simply put – move away from email collaboration for your file sharing needs. Finding a business solution for collaboration and data sharing will allow real access control, reporting, auditing and better cybersecurity. You likely need help moving from your current email collaboration system into something more stable, simple and secure. Let us help you secure your business and your file sharing needs for free! File sharing and email collaboration with email is just wrong - just plain wrong. Not only is it not secure, but it puts your business at a major risk!